Crafted Countertops, Inc is located in Genoa City, Wisconsin just outside of Lake Geneva (Serving Wisconsin & Illinois). We are your Fabrication & Installation Specialists! Contact us today for a free quote! Follow us Facebook & Youtube, and be sure to read our blog for current news and updates! At Crafted Countertops, Inc. we use state of the art machinery to fabricate your counter tops with the utmost precision. We offer Quartz & Natural Stone Counter tops for Kitchen Counters, Kitchen Remodeling, Bathroom Vanity, Fireplaces, Bar Tops & more! Combining state of the art laser scanning equipment with our skilled measuring technicians, we can replicate your room layout into our custom stone CAD system. 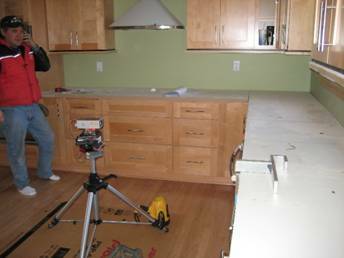 Once that is completed, we are able to confidently design your countertops with uncanny precision. We are even able to measure with your existing tops still on your cabinets so you can continue to use your old tops until your new tops are ready to be installed. 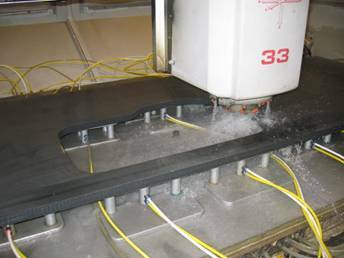 The next step is programming our CNC (Computer Numeric Control) machine to produce the exact dimensions of your countertops including the sink cutout, inside and outside radius corners and your selected edge profile. The edge profile is cut into the stone using a series of tooling, then polished with several sets of diamond polishing wheels to attain a smooth, almost mirror-like finish.